Hey there bloggies. 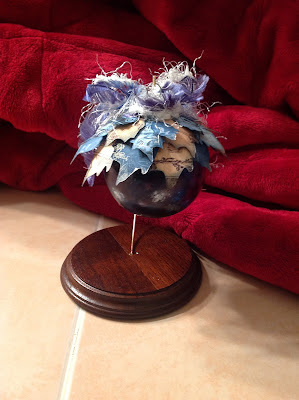 For this project I made an ornament with Alcohol Inks and Tim Holtz' new poinsettia die from Sizzix. I couldn't wait to try it out so I thought up something I could do with it. I started with one of those clear plastic ornaments from Michael's. Literally costs like 79 cents or you can buy a set of four. lol...I didn't buy glass because after all the work I didn't want any chances of it breaking. Anyway, I only bought one because I knew I wanted to do something with it but wasn't sure at the time exactly what.. So for the first step, I used the alcohol inks in the colors Eggplant, Stream and silver and the globe really turned out so pretty. 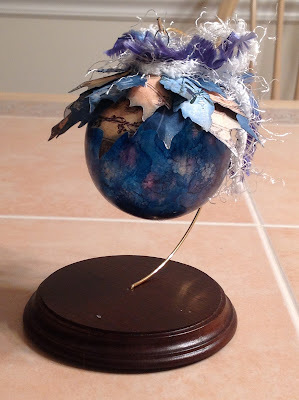 While the globe was drying I went through my paper stash and grabbed some blue tone paper and also an off white sheet of music paper. I used those to cut out my poinsettia leaves in the three different sizes. I cut out more than just one because I knew I was going to need about two or three of each leaf in order to go around the entire globe. I then cut them apart and inked the edges with distress ink in the Faded Blue Jeans color. Once those are cut your going to want to bend them a bit so that they sort of lay on the globe well. Once everything is dry and the poinsettia leaves are cut, I started hot gluing the leave around the edge and overlaying the leaves a bit. Start with the larger and then move to the medium and then the smaller leaves last. After that was done, I wanted to cover up some of that hot glue so I used a frilly white and blue ribbons to top it all off. Easy Peasy!! 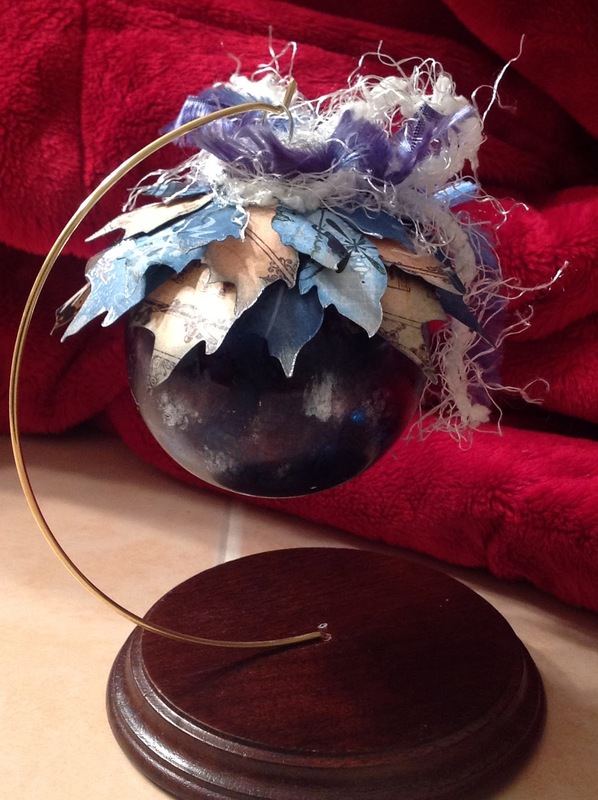 Here are some finished pictures....(I took one picture of the ornament without the red background so you could see the pretty colors in the globe, it came out so pretty. This a a beautiful ornament. I certainly looks like a winner to me! Fabulous and completely gorgeous! Thanks for questing with us at UPA! UBER FABULOUS!!! Great design and fab color...love this! Great project Claudine. The way you made it, it's lovely to see how this globe is 'pimped'. Give it a nice place!